The Association promotes the understanding of the importance of historic resources and their preservation. CG TV "White Way Walk"
HPACG presents check to the CG City Commission in support of the White Way Lights preservation project. A historic White Way light decorative base in need of restoration. City of Miami Mayor Tomas Regalado addressing the Florida Trust for Historic Preservation Members at Adrienne Arsht's Villa Serena in Miami. 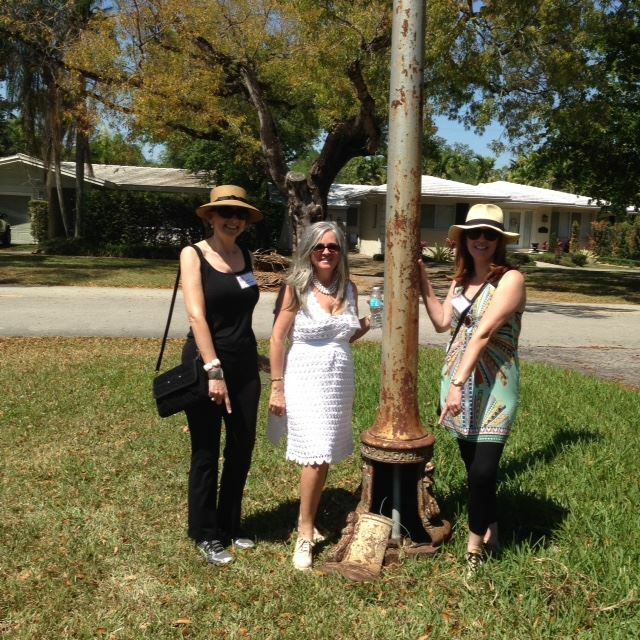 HPACG board members highlighting the damage to the historic White Way lights and the need for restoration and preservation. Currently, the Historic Preservation Association of Coral Gables is working with City of Coral Gables officials to bring attention to the condition and need for preservation of the nearly 70 remaining historic street lights known as "White Way Lights" in and around the Riviera Section. Most of the lights, designed in 1926 by Coral Gables artist Denman Fink - who was named Artistic Advisor to the City by George Merrick - are located along University Drive from Granada Boulevard past Ponce de Leon and along Riviera Drive from Granada to University Drive. The design of the lamp bases represent the Four Seasons/Ages theme and depict labor, architecture, horticulture, and art. The same theme is reflected on other City landmarks such as the City Hall dome murals and the relief sculptures on the De Soto Fountain. The "White Way Lights" were designated as a City Historic Landmark Site in 1981 and included on the City Historic Landmark Inventory. A collaboration with the Coral Gables Museum to support the weekly historic walking tours in Coral Gables.